Charles Wheatstone was one of the leading electrical engineers of the mid-nineteenth century, and began his career in the family musical instrument firm where studying the workings of musical instruments gave him a taste for physics. He was responsible for the introduction of the electrical telegraph where his scientific understanding enabled him to turn it into a practical technology. Charles Wheatstone was interested in musical instruments and their acoustics throughout his life. Parallel to these musical research he was working variously on typewriters, electromagnetic clocks, pitch measuring devices, and of course, the concertina and its prototypes as well as the electric telegraph which became his major life's work. There was no period in his life when he concentrated on just one particular subject, and throughout his life he constantly returned to work on various improvements to the concertina and related devices. He also invented two new devices to measure and regulate electrical resistance and current: the Rheostat and the Wheatstone bridge. Though nominally professor of natural philosophy at King's College, London, he seldom lectured after 1840, and indeed was an indifferent teacher. He suffered through life from an almost morbid timidity in presence of an audience. Wheatstone had a lifelong friendship with the scientist Michael Faraday (1791-1867), and due to Wheatstone's intense shyness, Faraday usually delivered Charles's lectures for him at the Royal Institution. Since 1832 Wheatstone was experimenting with simple stereoscopic drawings (geometric 3D-drawings) and in 1838 he made a so-called reflecting mirror stereoscope to view them. This technique proved that stereo perception was a result of binocular vision. Wheatstone's actual stereoscope is preserved at the Science Museum in London. In 1849 Sir David Brewster described a binocular camera, and the first stereoscopic photographs began to be produced. The most common type of hand-held stereoscope with an open skeletal frame is the Holmes stereoscope. Oliver Wendell Holmes (1809-1904) read law at Harvard University before deciding on a medical career. Following studies at Harvard and in Paris, he received his degree from Harvard in 1836. He practiced medicine for 10 years, taught anatomy for two years at Dartmouth College, and in 1847 became professor of anatomy and physiology at Harvard. He was later made dean of the Harvard Medical School, a post he held until 1882. Holmes achieved his greatest fame, however, as a humorist and poet. He wrote much poetry and comic verse during his early school years and in 1857, he contributed his 'Breakfast-Table papers' to The Atlantic Monthly and subsequently published 'The Autocrat of the Breakfast-Table' (1858), 'The Professor of the Breakfast-Table' (1860), 'The Poet of the Breakfast-Table' (1872) and 'Over the Teacups' (1891), written in conversational style and displaying Holmes's learning and wit. The Holmes viewer uses magnifying lenses to fuse the parallel side by side mounted stereo pairs and it holds the stereocard on a sliding arm for focusing. From 1890 on many photographers were making sterophotos that were mounted on cards with a size of 3.5 x 7 inches (approx. 9 x 18 cm). This size of cards became the standard size for Holmes stereocards. Stereocards were sold in sets and 3D images of all the wonders of the world were available. The cards remained a popular entertainment until the 1940's. Stereograph made by the famous American landscape photographer William H. Jackson. The stereocards were not only made by big firms like Keystone View Co, Underwood and Underwood,... but some local photographers made their own series. 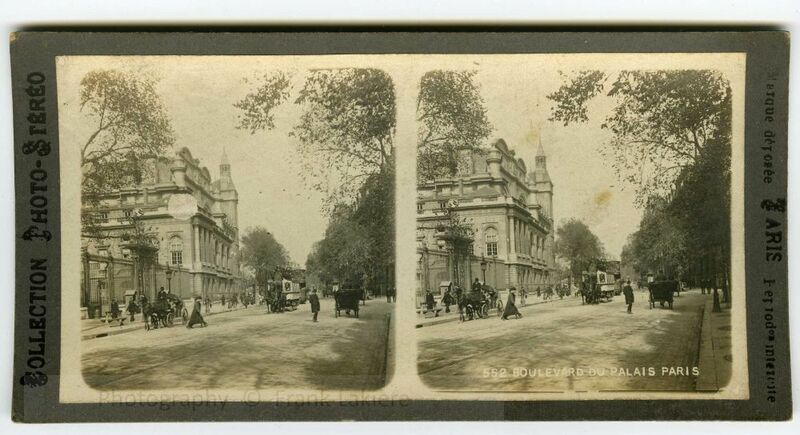 In Antwerp you had ANTWERP-STÉRÉO that made stereoscopic photographs of the city and the surrounding areas. They also made series of sporting events, of the world fair 1930, of the opera and of other festivities of all kind. These stereocards are contact-prints of stereo-negatives and the photos are not mounted on cardboard. The size is also smaller than the regular Holmes stereocards and thus Antwerp-Stéréo sold its own stereoviewer adapted to this format.